Powerful processor - Allwinner A64 uses 64-bit Quad-core Cortex-A53 CPU, Mali400MP2 GPU graphics processor, support H.265 4K video hardware decoding, support Android 6.0 operating system. The tablet is built to be a high-performance media tablet with PC-like browser, 3D gaming and cinema class home entertainment experiences. 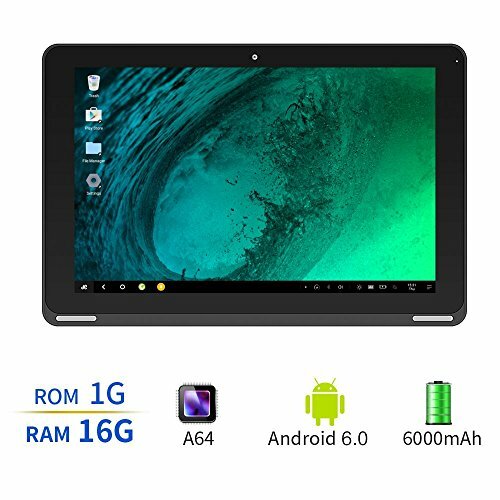 Brilliant Display: this B102 Android 6.0 tablet comes with a 10.1 inch IPS screen and a 1280*800 screen resolution, which allows for an amazing viewer experience whether you are watching movies, web surfing, playing games or mulling over spreadsheets. Unlimited Entertainment: Pre-installed Google Play brings you to the world of entertainment, tons of Apps for gaming, social, sharing - Facebook, Twitter, Netflix, Instagram, etc. Equipped with a 2.0MP rear camera and a 0.3MP front camera with auto focus, B102 lets you take photos and video chat with friends and family members. Ample Storage Space : the B102 Android 6.0 Tablet is loaded with 16GB of Internal Storage. Further storage can also be added via a micro SD card (Supports upto a 32-gb TF-card) (not included). Built-in 3.7V 6000mAH lithium battery gives you a longer standby time and longer experience time. Multi-Function: Wi-Fi (802.11a/b/g/n) keeps you connect to hotspots. It even could power up other device via the Standard USB port.